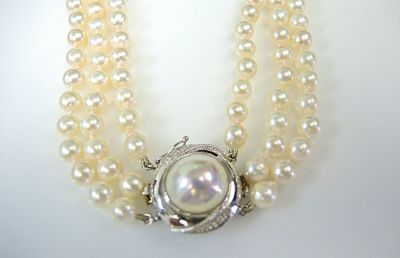 One triple strand of freshwater pearls. Three strands of pearls set with fifty-four, fifty-six and fifty-four pearls respectively (5.5-6.0 mm). The 14 karat clasp is set with one mabe pearl and four single cut diamonds (0.03 carats: SI1 clarity: H-I colour).